You may know Drumheller as the popular “dinosaur destination” during the summer months. But did you know there’s a lot more to Drumheller than just its signature dinosaur attractions, and plenty to explore all year-round? (Yes, even in the winter!) To spark your adventurous thoughts – we put together a list of the top FREE gems to explore in Drumheller during the fall and winter. You may have seen a beautiful sunrise, you may have even seen a beautiful Horseshoe Canyon sunrise, but have you ever seen the stunning view of a Horseshoe Canyon sunrise as it gleams over sparkling snow? What about the magnificent view of a glacier-carved “U” surrounded by golden prairies on a crisp fall day? Trust us, this is a sight you don’t want to miss. But don’t take our word for it, experience the sight that simply can’t be put into words with a trip to Horseshoe Canyon during the fall and winter months. You’ll be glad you did. This suspension bridge turns into an entryway to a winter wonderland during the crisp snowy months. Constructed in 1931, this bridge was once heavily used by coal miners in the area. Today, it is a popular and thrilling adventure located just nine kilometres outside of Drumheller. During the winter season, the Red Deer River (that sits directly under the bridge) turns into a snowy white blanket, creating the perfect scenic view for bridge travellers. Snap the perfect picture of this scenic snowy view, and brag to your friends about the time you were brave enough to cross an iced-over suspension bridge. Who said the Hoodoos were only spectacular during the summer? We’ll let you in on a little secret. These sandstone masterpieces transform under the white blankets of snow and take on an all-new stunning appearance. You may think you’ve seen these incredible sandstone pillars, but we want you to experience an all new side to the Hoodoos: the side of a true winter wonderland. How many people do you know have stood next to frosted stone wonders? Be the first of your friends to experience the beauty! Remember, the Hoodoos are very fragile all year round so climbing is not permitted. Built originally as a place of worship and prayer, this little church can fit over 10 000 people…but only six at a time. This tiny attraction may be small, but it’s a great place for big adventures all year-round. Built with pews and a pulpit, the Little Church is especially spectacular to visit during the Christmas season. The Little Church was originally constructed in 1968 by local contractor Trygve Seland, in co-operation with the Ministerial Association. In 1991, the church was reconstructed into what it is today by inmates of the Drumheller Institution. Not to be mistaken with Horseshoe Canyon, this beautiful canyon was once a hideout for outlaws more than a century ago. Today, it is your perfect spot to admire the colourful layers of the canyon rock mixed with the beautiful shades of fall. Take in this stunning view through a different coloured lens every season, as the summer scene you’re used to transforms into dazzling blankets of white in the winter and wisps of gold in the fall. Look out onto the Red Deer River from this natural lookout point, situated on the high red rock cliffs. This lookout point turns into a sunset-lovers dream, as the colours of autumn transform the area with beautiful hues of red, gold and orange. Watch the Red Deer River snake its way along the valley, or come back in the winter months and enjoy the serenity of complete stillness and frozen beauty. Remember, there is no fence on the cliff so be sure to hold children and pets close and keep them far away from the edge. Beautiful walks aren’t just for the summer months! Enjoy a scenic stroll along the pathways of Drumheller during the fall and winter, and absorb a new take on the breathtaking scenery of the area. 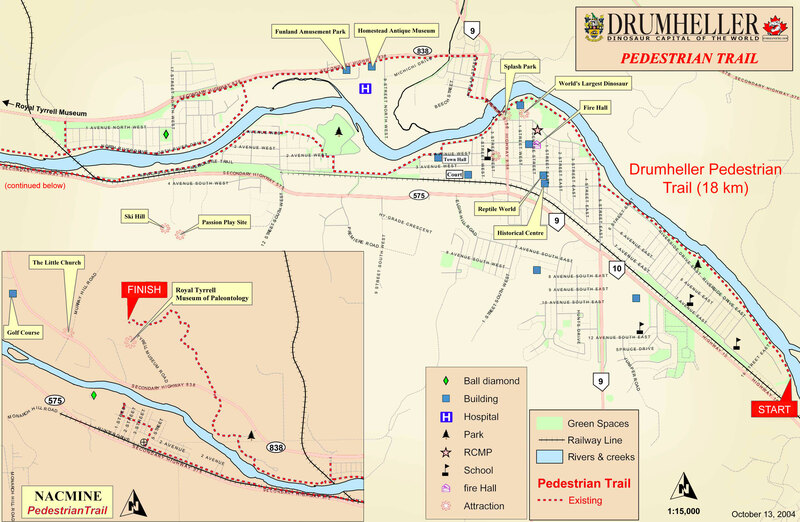 There is 18 kilometres of pathways that run along the Red Deer River, downtown and the Royal Tyrrell Museum, so you can be sure to hit all the main attraction sites in the most scenic way possible. Fall and winter are beautiful times to visit Drumheller. Plus, they provide the ideal opportunity to steer clear of the crowds during the Badlands offseason. As witnessed above, there’s still so much to do around here when the temperate dip and the air gets crisp. See you soon my travelling friend! Feature image courtesy of Laurie Shannon.